A sure thing rarely is. So, I’m comforted by the fact the mainstream financial press isn’t talking about gold. Because, by many measures, an investment in gold looks like a sure thing right now. And I wouldn’t be surprised to see an 11% rally in the next three to six months. Inflation, interest rates, risk aversion, summertime and gold price apathy should excite gold bulls. Let’s start in Italy, where brazen politics threaten investors’ confidence in the euro zone. A face-off between the establishment and populist parties brought the sustainability of the Economic Monetary Union and the euro currency into question this week. Investors are right to be worried. Italy is a major European economy with a mountain of debt second only to Greece. Risk aversion like we saw Tuesday helps safe-haven assets like gold. But even before Italy shook the markets, a scenario was shaping up that could become hugely bullish for gold prices. If they can, the U.S. Federal Reserve intends to continue hiking interest rates because the U.S. economy is growing. But Fed policy has far-reaching impact. Europe’s economic recovery seems to have stalled. Emerging markets are facing pressure from a stronger U.S. dollar and rising oil prices. And it begs the question: Can the Fed keep hiking rates if it puts additional pressure on foreign economies? Investors are likely to say no. And that means rising U.S. interest rates will slow or reverse at a time when U.S. inflation is picking up. 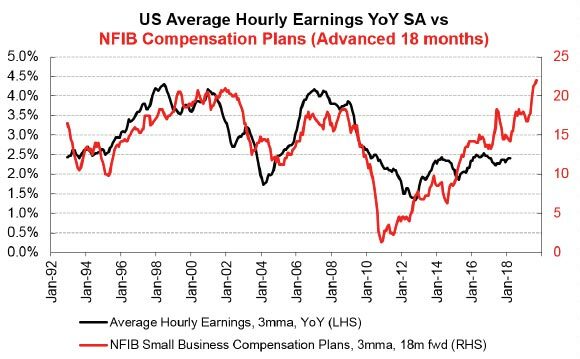 The National Federation of Independent Business (NFIB) suggests we’ll see a significant pickup in U.S. wage growth this year. Demand for cargo and freight trucks is skyrocketing, and associated costs are rising at the same time as fuel costs. 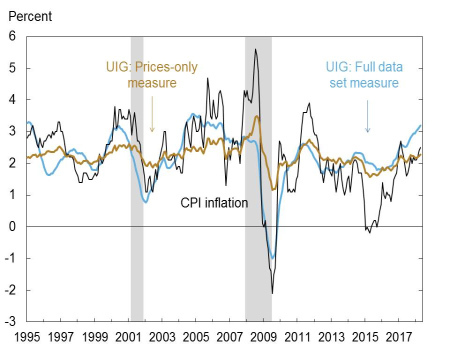 Surveys from manufacturing and nonmanufacturing companies helped drive the New York Fed’s Underlying Inflation Gauge (UIG) to 3.2%, a faster clip than the Consumer Price Index (CPI), which is currently at 2.5%. Source: Authors’ calculations, based on data accessed through Haver Analytics. Note: The shaded areas indicate periods designated recessions by the National Bureau of Economic Research. Conventional inflation gauges are within the Fed’s comfort zone. But economic activity suggests stronger price pressure is coming. If worries in Europe and emerging markets rein in Fed rate hike expectations while inflation is on the rise, U.S. real rates (nominal rates minus inflation rate) could decline. Historically, this is an inverse relationship: Negative (or falling) real interest rates tend to push the price of gold higher. And here we’re approaching summer, the best time of year to buy gold. The situation is no different in gold. 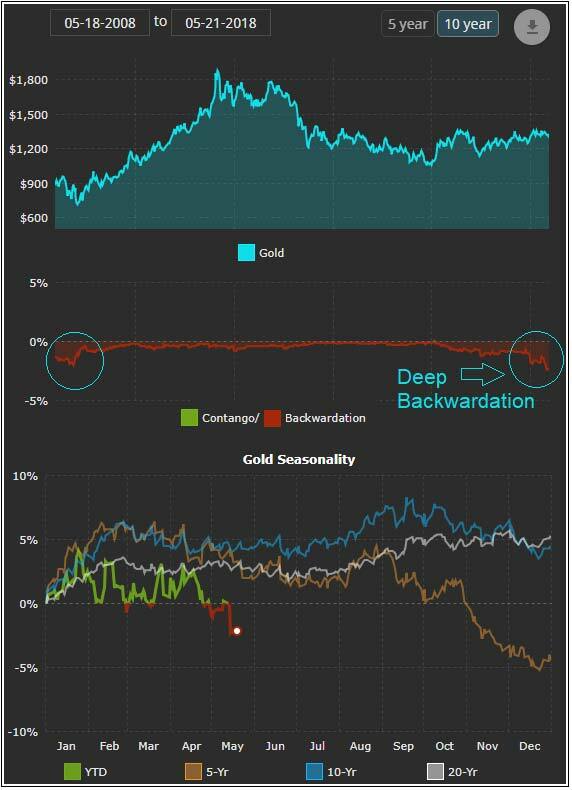 Gold futures prices — the prices where players expect the underlying asset to be trading at a predetermined time in the future — are in what commodity traders call “deep backwardation.” That simply means everyone expects the price of gold will go down in the next 12 months. Gold’s backwardation hasn’t been this extreme since 2008, when gold went on to climb as much as 136%, triple-digit gains, in the following three years! The iShares Gold Trust (NYSE: IAU) is an easy, conservative way to invest in a rising gold price. But if you’re looking for magnified returns, consider a double-leveraged product like the ProShares Ultra Gold ETF (NYSE: UGL) that’s designed to rise twice as fast as the price of gold.